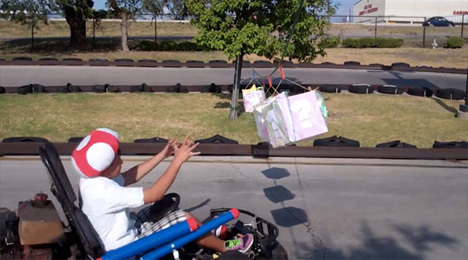 We’ve seen real-life versions of Mario Kart before, but they were really just fun novelties. Hunter Smith and Ben James, both engineers from Texas, have blown those other real-life MK versions right out of the water by making a real, playable version of the game – complete with power-ups and obstacles. We don’t want to fawn too much here, but it is probably the greatest thing ever made by anyone, ever. As players drive around the track, they grab at item boxes suspended above the track. Thanks to embedded RFID tags, the carts recognize which items were grabbed and react accordingly. Players can throw banana peels into competitors’ paths to trip them up, just like in the game. The carts are souped-up go-karts with a few special modifications that let them react to the power-up items. The brakes, steering and acceleration are all affected by the items hidden in the mystery boxes. Sadly, the game in the video was only a temporary set-up – but Smith and James were kind enough to post specs to help other Mario-loving engineers build their own version. Please – someone build a permanent version and we’ll be first in line for tickets. See more in Art Vehicles or under Transportation. January, 2013.